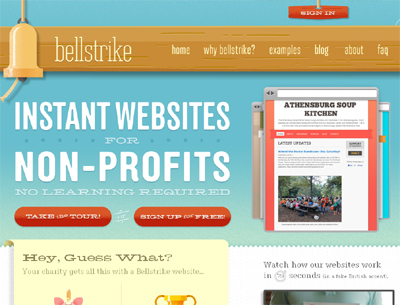 Bellstrike lets nonprofits set up attractive, donation-enabled websites in about 1-2 minutes. There are plenty of website builders out there but none focus on nonprofits and none help nonprofits accept online donations, much less during the 1-2 minutes sign up process. There are no setup fees or monthly charges. Bellstrike takes a percentage of online donations but caps its fees every month.